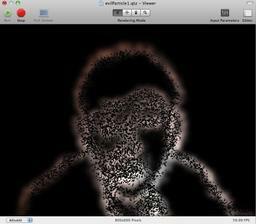 It lets you detect edges of your input video or image and emit evil particles from the edges. I haven't really checked compatibility except my personal setup, OS X 10.6.8 and Quartz Composer 4.0. Hopefully it will work with other configuration too.